Unsolicited email or Spam accounts for over 14.5 billion messages globally per day and growing. Most of these unwanted messages fall into the categories of advertising-related emails, adult-related topics and financial matters. However these categories account for only a small portion of the total spam while Identity theft also known as “Phishing” makes up the majority of Spam received. Is your company inundated with Spam? Do you want to increase productivity for all your employees? While no technique is a complete solution to the spam problem, with each having some form of trade-offs between incorrectly rejecting legitimate email (false positives) vs. not rejecting all spam (false negatives) then see below our recommended solution. For Internal Mail Servers – The anti-spam gateway is installed between your mail infrastructure and the Internet. It offers professional protection and eliminates up to 99% of spam. 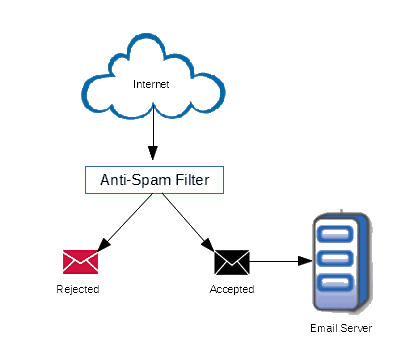 Our recommended solution uses multiple anti-spam filters that combine SpamRazer Technology, Greylisting, IP Reputation Filtering, Bayesian filtering, Content Filtering, and Email Policies. This product comes with a Central Management Interface and as a bonus also includes up to 5 antivirus scanning engines for added protection. Would you like to know more about this product or get a trial version, then give us a call? Don’t click the “Unsubscribe” link (These actions only serve to confirm to spammers that you exist and you are receiving their emails). Preview your messages (If you use Outlook you can preview messages in the preview screen before actually opening them).